I absolutely LOVE this process and have done it many times, but never did a post about it.....so here it is! 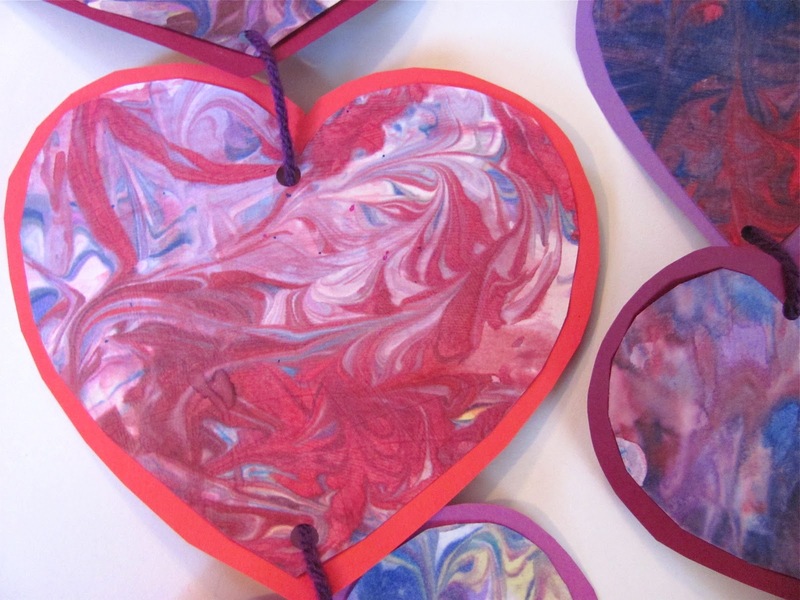 We made Marbled Valentine Hearts with shaving cream! Here are some of our beauties. We put them on a string/yarn as a decoration to hang vertically or as a garland! To begin, spread shaving cream in a tray and flatten the top a bit like this. About an inch deep of shaving cream. Now drip watered down paint or food coloring with a paint brush or eye dropper on the surface of the shaving cream. 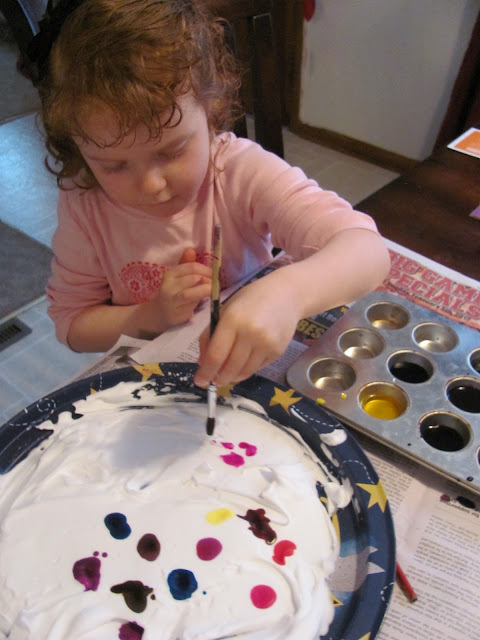 Then, take a stick or comb and swirl around the paint to create zig zags, curvy lines, or whatever you choose. Then lay down a paper on the marbled shaving cream. Now take a straight edged piece of plastic or piece of cardboard (we used a plastic lid cut in half), and scrape the shaving cream off the heart. Messy! Under the shaving cream layer will reveal a GORGEOUS marbled effect! Let them dry for a few hours. Then we glued them on colored paper to frame them. Here is a close up of one of my favorite marbled hearts. Here are bunches of our marbled shaving cream hearts! Love them all! After we made bunches of hearts C just wanted to play in the shaving cream which is always a FAVORITE! Thanks Aleacia! I've never waited over night to rub the shaving cream off? I thought it had to be removed soon after! Maybe next time we'll try it that way! Thanks Roopa! Garland always makes everything better and it brings them to completion! I don't have a little one at home any more, but I do teach Preschoolers in my art class. I haven't worked with food coloring and shaving cream before... I wondered if the food coloring stained their hands, and did it wash off easily? I love the activity... lots of sensory play. Hi Bea, Good question! In this process you don't even have to have the preschoolers touch the shaving cream/food color so it may not even be an issue. AS you can see my daughter did touch the shaving cream and it did stain her hands a bit, but not much. You can decide how much you want them to touch the shaving cream. Maybe even let the children play with shaving cream on the table tops before the activity and they will have less desire to touch it! How clever! Love the how the marble-effect is revealed! WIll have to try this one. Thanks! It is a great process Julia, hope you get a chance to try it out! Let me know how it goes. Very cool! We've done the same but used acrylics. Messy but fun. Now 22 Valentines are written and ready to go to school next week. Yes, pretty much any paint can be used, I just water it down. Congrats on having all the valentines written out! This looks like so much fun! You are brave with the mess - but I am so inspired now. Thanks for sharing! Yes it is Lynee! It is messy, but I do put up with a lot for the sake of Art! Hope you decide to take the plunge and try it! These turned out so well - and I would never have thought that the marble effect would stay under the foam, after being scraped. I will definitely do this in some form this year with my children. Brenda it is a magical process! Truly! It is amazing when you scrape off the shaving cream.....who would have ever thought? Enjoy this with your children! Thanks. Love this idea! I can see it also working with Easter eggs! Can't wait to try it with my grandchildren! I have done this with Easter eggs but never thought about Valentines! Would love to try it with Easter Eggs! I've done marbling kits with eggs, but never with shaving cream. Thanks for the input. These turned out really pretty! I love how strung them too. Shaving cream painting is so much fun! I love the garlands you made - hope we have time to make these tomorrow! I hope you have time to make these too Meghan! You'll not be disappointed with the results! Thank you! YOur talk of shaving cream inspired me to do this project with my daughter! These are so great and he tutorial is so clear!... Thank you so much...I will make a link to this when we will do this! Thank you! So glad to help and inspire! If there any problems just let me know but i wanted to spread the word about your site. No problem....thanks for linking back to me! Sure, I'll have to stop on over! Those are absolutely beautiful! I love them! This is a beautiful craft! I'm raiding my husbands shaving cream tonight! Just posted- a little late on Craft Gossip, but I thought it was too good to pass up! Does the shaving cream come off? It's a great idea and the hearts are so pretty! This is a beautiful project, thanks so much for sharing it. I'm already picturing this done in egg shapes for Easter & flowers & butterfly shapes for spring/summer!!! !